Techcrunch staff bad for your pc! Browsing yesterday I thought I’d go check out the gobby, witty and amusing brit on Techcrunch… aka Paul Carr and thought the fastest way would be to click the “staff” link which is at the bottom of the site… up popped this!! Right click open in new tab for bigger picture. 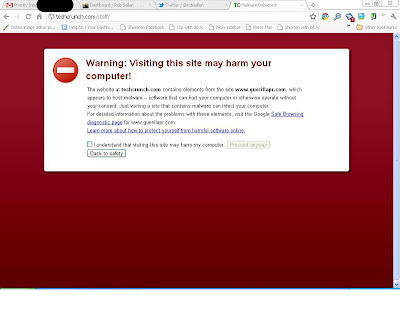 Well, it also say’s on there what site is hosting it … if they see this post… don’t attack me, chrome showed me this! 😆 Go tell the big G! Glad chrome spots this sort of thing and stops you before you get hit. ← G.A.S.P, 10.10.10 and no spam! Chrome did that to me too. It’s not fun when it happens. Usually it is because some site that you link to has been hacked, or even more common, an image that you have hotlinked is the culprit. Usually commenting out the offensive code until the third party fix the problem is the best and safest COA. Rob Sellen´s last blog post ..GASP- 101010 and no spam! to clarify: not something that you clicked. Most often when this happens it is because the page you are trying to load is either linking or hotlinking to yet another third party with a malware warning. That is what happend to my blog… but yeah, it really is funny. Rob´s last blog post ..Internet marketing syndicate vs robot- my money is on the robot!